At Colten Care’s Dementia Utopia conference at AFC Bournemouth’s Vitality Stadium are, from left: Operations Director Elaine Farrer; Admiral Nurse Kay Gibson; Adam Smith, Dementia UK’s Consultant Admiral Nurse for the South of England and Wales; Mark Aitchison, Colten Care Chief Executive; Suzanne Hill, Colten Care Head of Learning and Development; and Hayley Sylvester, Learning and Development Business Partner. 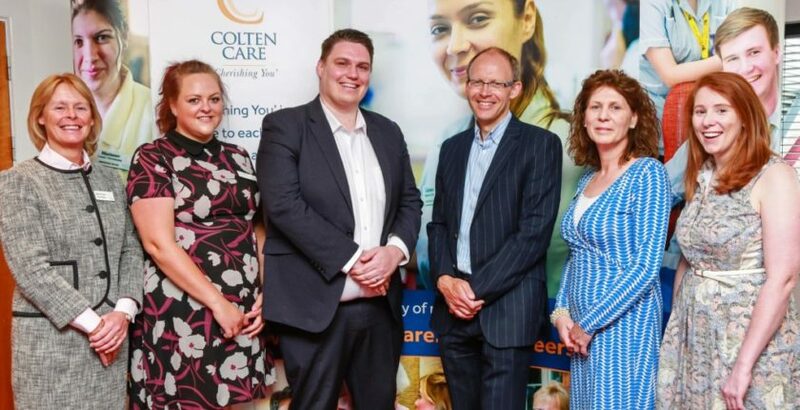 South coast care home operator Colten Care is expanding its specialist nurse provision to help more residents and families overcome the challenges of living with dementia. Colten Care is recruiting two more Admiral Nurses under its partnership with Dementia UK following the positive impact of a first post-holder. Since its first Admiral Nurse Kay Gibson was appointed two years ago, Colten Care has evolved a dementia care strategy benefiting residents, families and communities around its 20 nursing homes, including its five dementia-specific care settings. While Kay has run regular community drop-in sessions at Colten Care’s Dorset dementia care homes, the new Admiral Nurses will strengthen the level of specialist support at homes in Winchester and Lymington when they take up their posts in the autumn. The move was announced to more than 60 care professionals attending the provider’s fourth annual Dementia Utopia conference at AFC Bournemouth’s Vitality stadium. A key focus, reflected throughout the conference, was on what good clinical care, dining, companionship and other parts of the care mix look like in the context of trying to live well with dementia. For more information on dementia care and to connect with Admiral Nurse Kay Gibson, visit www.ColtenCare.co.uk/Admiral-Nurse.